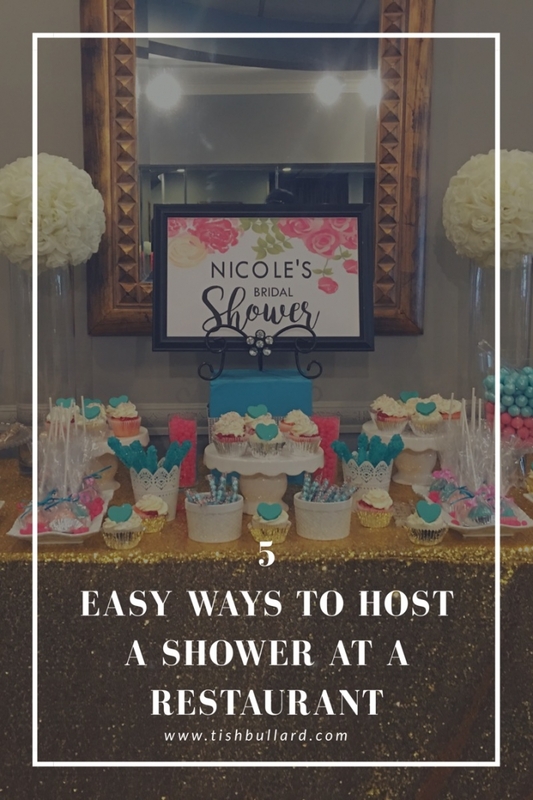 I have included 5 easy tips for you when hosting a baby or bridal shower at a restaurant. Also, you can check out my video tutorial sharing these tips with you. 1. Find out the logistics. Ask which room or area of the restaurant will the shower take place and how many people it will accommodate. You will also need to get information about pricing minimums/maximums, menu options for special parties, setup and breakdown times and any other restrictions. Also, if you are planning on asking your guests to pay for their own meals, be sure to include this information and pricing in any communication (i.e. Invitations or word of mouth) with them prior to the party. 2. Plan your design based on the location. If you are able to see the area for the shower ahead time either by visiting the restaurant or viewing pictures online, take advantage of it. This will help you know how to decorate your space. 3. Personalize your space. Linen may already be provided at the restaurant in the basic colors such as black, white or ivory. 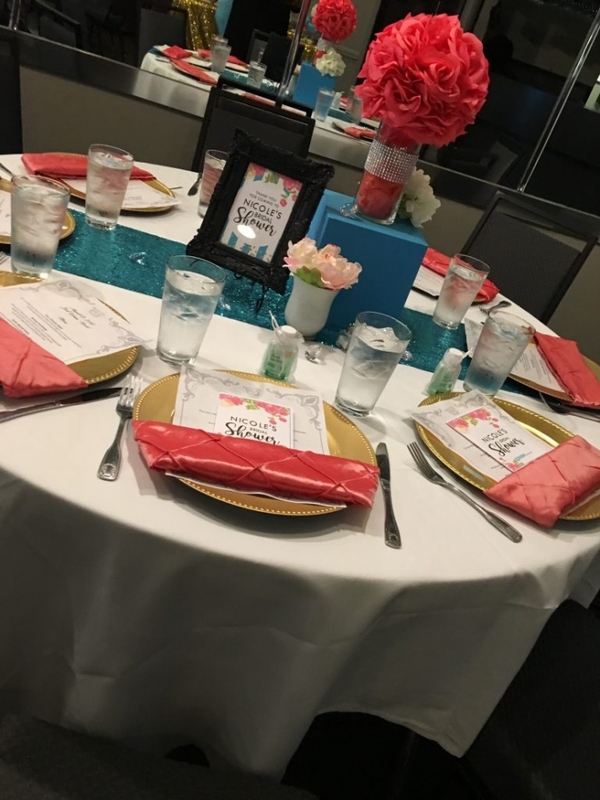 Check beforehand to see if you can provide your own linen (if the setup time will permit) or add table runners and napkins in your party’s colors to personalize the space. Include personalized frames with special sayings or the guest of honor’s name or photo in them. 4. Treat your guests. You won’t go wrong spoiling your guests that came out to share in the love. 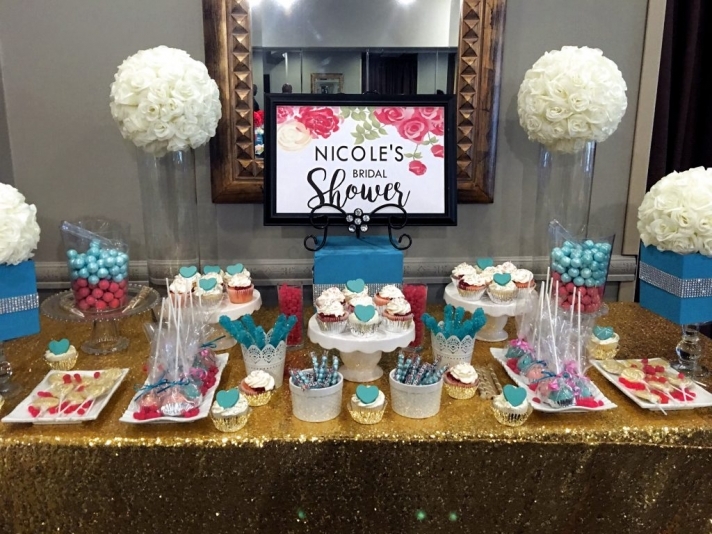 If your restaurant will allow it, give special treats such as a cookies, cupcakes or setup a dessert station for guests to package up as favors. Don’t forget to personalized your treats with cute tags or labels. If you are planning on bringing your own cake, double check with the restaurant to see if this is allowed. 5. Don’t forget the games and gifts. Definitely include a fun game or interactive activity to connect the guests with the occasion and break the ice. Place personalized game booklets or cards at each place setting and provide pens (if needed). This is another way to add a personalized touch. If gifts are to be received or expected, spot out an area of the shower space to house gifts. Be sure to include enough time in your shower to showcase the gifts (if you are doing this at the shower). Be sure to make arrangements with the restaurant to have the table space you need for gifts. I hope these 5 tips help you get started with planning a bridal or baby shower at a restaurant. I’d love to hear from you. Need help with planning your intimate party? Fill out the contact form and let’s schedule some time to chat.